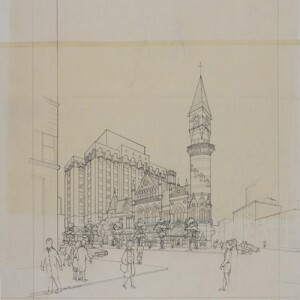 Giorgio Cavaglieri, Jefferson Market Library elevation, pencil on tracing paper. 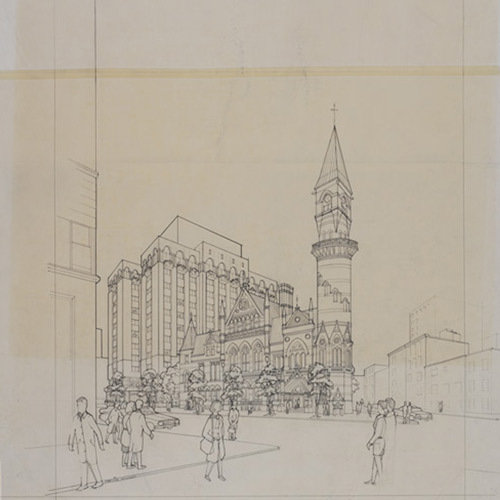 Many believe New York’s pioneering Landmarks Law, enacted in April 1965, was the key factor in the rebirth of New York in the final quarter of the 20th century. It ensured that huge swaths of the city remain a rich complex of new and old. It also ensured the creative re-use of countless buildings. At the same time, a new body of important architecture has emerged as architects, clients, and the Landmarks Preservation Commission devised innovative solutions for the renovation of landmark buildings and for new buildings in historic districts. Saving Place is presented to celebrate the law’s 50th anniversary. This entry was posted in Avery Classics Collection, Avery on the Road, Drawings & Archives, Exhibitions, Uncategorized on April 22, 2015 by Ted. 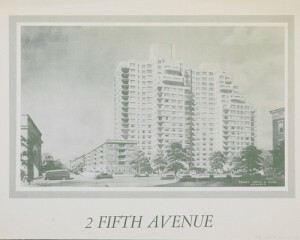 In recognition of the 50th anniversary of the Landmarks Law, the granting of regulatory power to the Landmarks Preservation Commission, and the tireless work of the preservation community, the Speaker of the City Council issued a proclamation at the April 16th City Council Stated Meeting acknowledging this historic anniversary. Avery Library was invited to attend the proclamation in honor of its early and continued support of the Commission and its work. 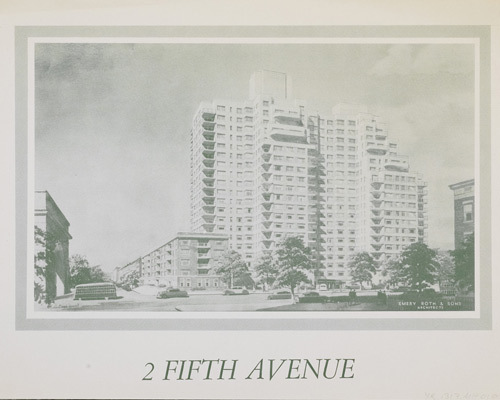 Leading up to the enactment of the New York City Landmarks Law, Avery Library directors Talbot Hamlin (1934-1946) and James van der Pool (1946-1959) played a significant role in the discussion and formation of lists of buildings worthy of preservation. Following his retirement as Avery director, Adolf Placzek (1960-1980) was a Landmarks commissioner from 1984-1993, presiding over a number of significant designations. The Landmarks Preservation Commission offers a Placzek Fellowship every summer for students of architectural history and historic preservation. CUNY TV video “Landmarks50 at The City University of New York” featuring Seymour B. Durst Old York Library material on the B. Altman building from Avery Classics. This entry was posted in Avery in the News, Drawings & Archives, Exhibitions on April 17, 2015 by Ted. 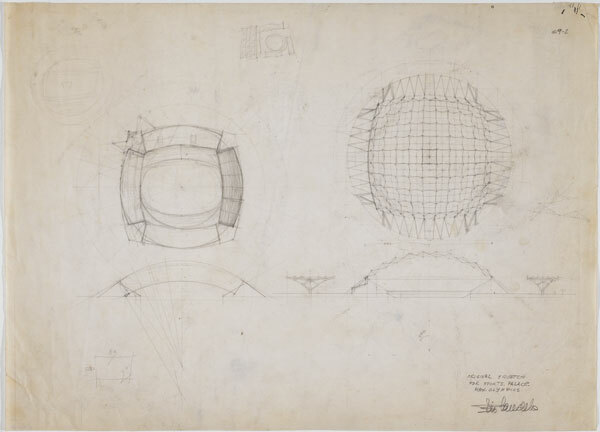 A never-before exhibited scrapbook documenting Frank Lloyd Wright’s 1931 trip to Rio will be on display in the Latin America in Construction: Architecture 1955-1980 exhibition at the Museum of Modern Art from March 29-July 19, 2015. The scrapbook, part of the Frank Lloyd Wright Foundation Archives, and 2 drawings of the Sports Palace in Mexico City by Felix Candela are on loan to the exhibition from Avery Library’s Drawings & Archives Department. The show offers a complex overview of the positions, debates, and architectural creativity from Mexico and Cuba to the Southern Cone between 1955 and the early 1980s. The exhibition features architectural drawings, architectural models, vintage photographs, and film clips alongside newly commissioned models and photographs. While the exhibition focuses on the period of 1955 to 1980 in most of the countries of Latin America, it is introduced by an ample prelude on the preceding three decades of architectural developments in the region, presentations of the development of several key university campuses in cities like Mexico City and Caracas, and a look at the development of the new Brazilian capital at Brasilia. This entry was posted in Avery on the Road, Drawings & Archives, Exhibitions and tagged Latin America on April 8, 2015 by Ted.